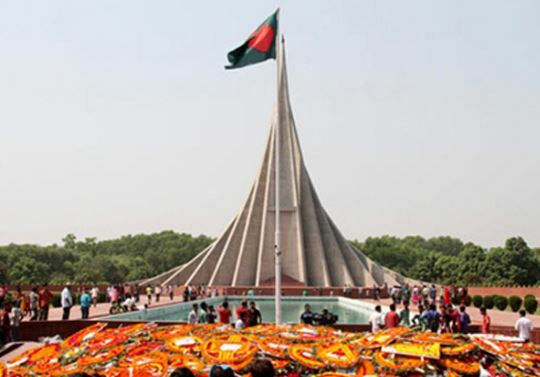 Members of the diplomatic corps, Families of Bir Shreshthas, war wounded freedom fighters, leaders of different political parties in Bangladesh, social, cultural and professional bodies and general people of Bangladesh are laying wreaths at the National Memorial in the morning of 26 March 2019. 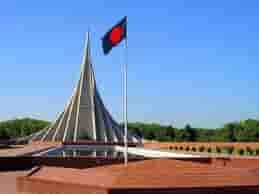 March 26 is a public holiday in Bangladesh. The national flag of Bangladesh flies atop all government and private buildings while all streets and important city intersections will be tastefully decorated with national and multi-coloured miniature flags and festoons. Important buildings and streets in Dhaka and other cities of Bangladesh illuminated with colourful lights and flags. Pakistan, which emerged constitutionally as one country in 1947, was in fact a double country, the two wings were not only separated from each other by more than one thousand miles, they were also culturally, economically and socially different. The cure, at least as far as the East Bengalis were concerned, proved to be worse than the disease. The people of Bangladesh discovered their identity through the Language Movement in 1952. The struggle to establish their identity and national spirit began soon after 1947 when they realized that under Pakistan created on the two nation theory they was little scope for the distance culture of Banglees to flourish . The refusal of the central government to grant status to Bangla language became the focal point of struggle, because language was the most important vehicle of the cultural expression of the people of this land. The contradiction of the two Pakistans , the racial oppression and the exploitation of the West over the East was gradually unveiled. The struggle for the consciousness of identity and cultural freedom which began with the advent of the student movements of the 60’s gained momentum in the mass movement of 1969. 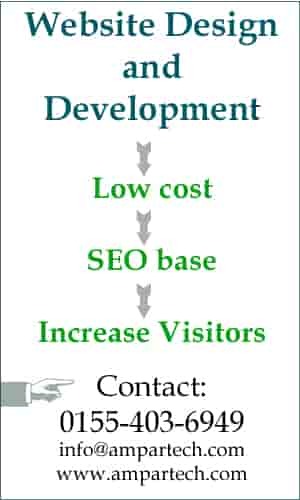 Though it brought about the fall of a mighty military ruler like Ayub Khan, the ultimate goal was not achieved. In December 1970, elections were held throughout Pakistan to choose an assembly that would serve as a legislature and write a new constitution. The Awami League, a party led by East Pakistan’s Sheik Mujibur Rahman (known as Sheik Mujib), won a majority of the seats. The party strongly supported increased self-government for East Pakistan. On March 1, 1971, President Yahya Khan of Pakistan postponed the first meeting of the assembly. East Pakistanis protested, and Yahya Khan sent army troops to East Pakistan to put down the protest. Sheik Mujib was imprisoned in West Pakistan. Sheik Mujibur Rahman declared at a historic public meeting held at Ramna Race Course (renamed Suhrawardy Uddyan) on 7 March, 1971, attended by around 2 million people, “This time the struggle is for our freedom” It was given at a time of simmering tensions between the increasingly secessionist Bengali populace of East Pakistan and the powerful political and military establishment of West Pakistan. During the speech, Sheikh Mujib proclaimed his most famous words in a thunderous voice- “Ebarer sangram amader muktir sangram, ebarer sangram amader shadhinatar sangram”, meaning, “This time the struggle is for our freedom, this time the struggle is for our independence”. He also announced the historic “non-cooperation” movement in the province which would prove to be one of history’s greatest civil disobedience movements along with the Salt March of Mahatma Gandhi and the American Civil Rights Movement. A planned military pacification carried out by the Pakistan Army — codenamed Operation Searchlight — started on 25 March to curb the Bengali nationalist movement by taking control of the major cities on 26 March, and then eliminating all opposition, political or military, within one month. Before the beginning of the operation, all foreign journalists were systematically deported from East Pakistan. It was decided that they should go back to the other side of Kalurghat bridge where rations had just been delivered to the jawans of East Bengal Regiment under the command of Major Ziaur Rahman. As the Bengali soldiers took positions to guard the transmission center, the rebels put their heads together and secured the help of a few engineers of the Kalurghat industrial complex to convert it into a broadcasting station. As Kalurghat was getting organized into a nerve-center for coordinating the liberation struggle, Baluch troops had invaded the EBR (East Bengal Regiment) barracks where under the command of Major Zia a bloody battle raged. Major Zia had to retreat and with a battalion of troops came to Kalurghat. He was made commandant of the rebel forces at Kalurghat where the transmitter was now ready for broadcasting. Contact could not be established between the leaders of the Awami League and Major Zia broadcast a message of independence to the people of Bangladesh. At 7:45 pm on 26th March 1971, Major Zia broadcast the message which became historic in the struggle for independence. Major Zia’s message was picked up by a Japanese ship anchored mid- stream in Chittagong harbour. When the news of this declaration was broadcast by Radio Australia, the rest of the world came to know of it. Duration of nine months war, approximately 3,000,000 (Three millions) of civilians died in that bloody fighting that followed, and millions of refugees poured into India. During the early months of the civil war, East Pakistani guerrillas also crossed into India. The government forces shelled Indian territory and followed the guerrillas across the border. Indian troops fourth border clashes with the Pakistani government soldiers. In December 1971, few thousands Indian army advanced into East Pakistan and joined the guerrillas. The combined forces of the Guerrillas and Indians overpowered West Pakistan, which surrendered on the 16th December, 1971.